Megaman - Hegarty Lighting Ltd.
MEGAMAN® is a global brand to have exclusively provided energy-efficient lighting products throughout its lifetime. The brand has gone from strength to strength over 20 years since 1994; and has come from developing the industry's first classic shaped CFL to now boasting a full range of metal halide replacement LEDs, launching revolutionary Smart Lighting Solution, a full range of LED Components and a suite of LED luminaires. The 141435 Megaman GU10 6W 4000K dimmable cool white LED bulbs are the perfect replacement for any halogen or incandescent reflector lamp. They help to cut maintenance costs, electricity bills and reduce heat emissions. 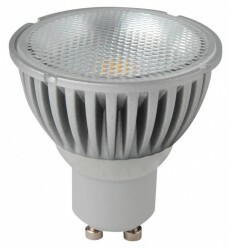 The 141401 Megaman GU10 6W 2800 dimmable warm white LED bulbs are the perfect replacement for any halogen or incandescent reflector lamp. They help to cut maintenance costs, electricity bills and reduce heat emissions.